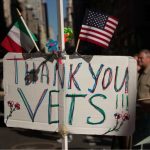 NYC veterans give their thoughts on the president elect. It quickly became clear none of the debaters were Trump supporters. They came from all over the country to take on the more subdued Hilary Clinton supporters. NYPD officer Peter Liang fatally shot East New York resident Akai Gurley in an the unlit stairwell.